ARK believes that shared car services like Uber and Lyft already are impacting auto sales, and that autonomous cars will push this trend into overdrive. In developed markets, our research shows that auto sales will collapse over the next decade, eventually reaching equilibrium at roughly half of today’s levels. 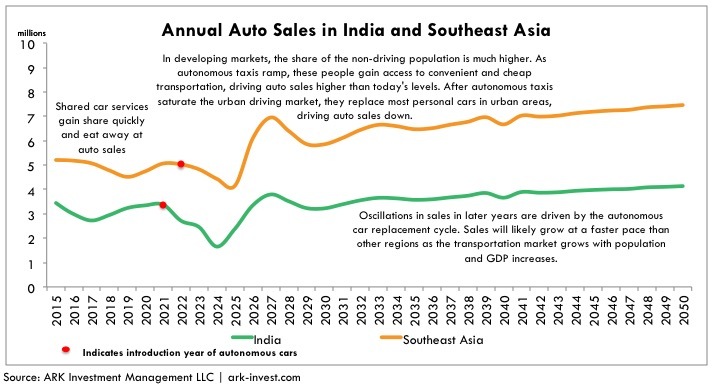 By contrast, in the developing world, auto sales may not drop dramatically, but the sales-mix will shift from manually driven cars purchased by individuals to autonomous taxis purchased by service-providers. in developing markets, a shared ride service is more compelling than is owning a vehicle, as hourly wages are far lower relative to vehicle prices than in the developed world. 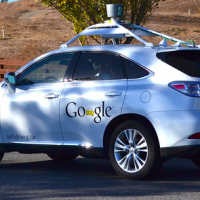 Autonomous cars likely will accelerate the trend away from personally owned vehicles. ARK believes that autonomous cars could be priced at 35 cents per mile, roughly half of what drivers pay for personally owned cars today. 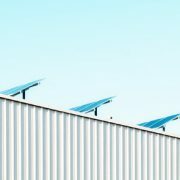 Consequently, we think consumers will forgo buying cars and eventually will sell or discard cars that they no longer use. 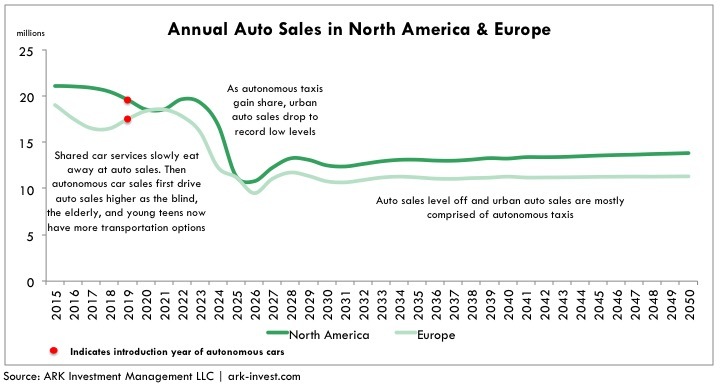 In North America and Europe, autonomous cars could cut auto sales in half by the late 2020s, as shown below. 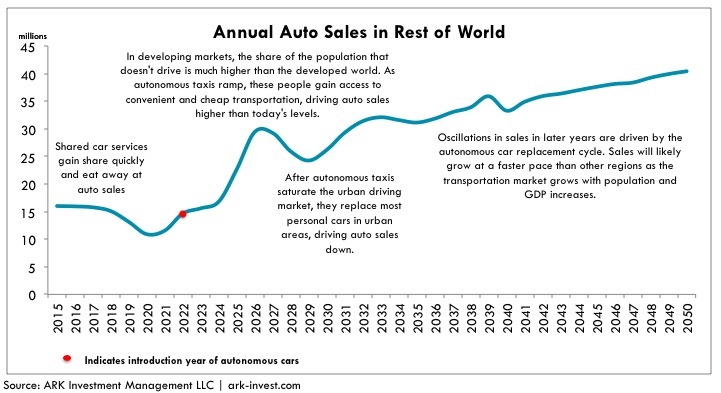 As can be seen in the graph above, car sales probably will increase modestly in North America and Europe after the introduction of autonomous taxis. Suddenly, the non-driving population, including the blind, the elderly, and young teens, will have access to inexpensive, convenient transportation. 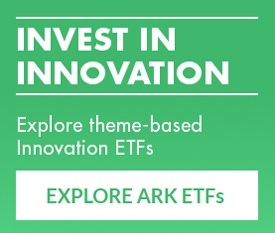 ARK believes the acceleration in demand growth should boost the number of autonomous taxis sold. Thereafter, total sales will descend to record low levels as autonomous taxis gain share, obviating the need for personally owned vehicles in urban areas. Used car sales and prices are likely to plummet as drivers give up their personal vehicles. 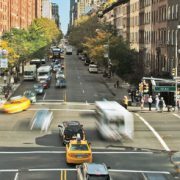 In China, only 20% of the population have drivers licences, compared to 70% in the US.2 Given the much lower total cost of usage, we believe growth in the demand for autonomous cars should spike to 30 million units by the middle of the next decade before downshifting to a steady state rate of 23 million units in the 2030’s, as shown below. 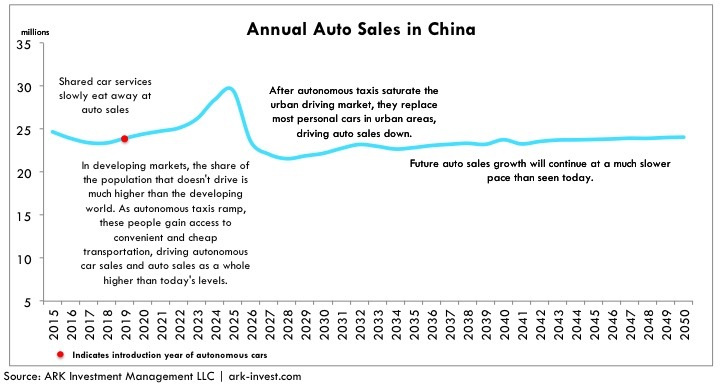 In other developing markets with a large proportion of non-driving consumers, we think the pattern will be similar to that in China, though stronger demographics will continue to propel demand for autonomous vehicles in those countries, as shown below. Consequently, it is likely that automakers focused on the developing world should be in a better position to sustain growth than will players with significant exposure to US and Europe. ARK expects global auto sales to be much lower than most forecasters anticipate, thanks to the adoption initially of shared car services and subsequently of autonomous taxis. 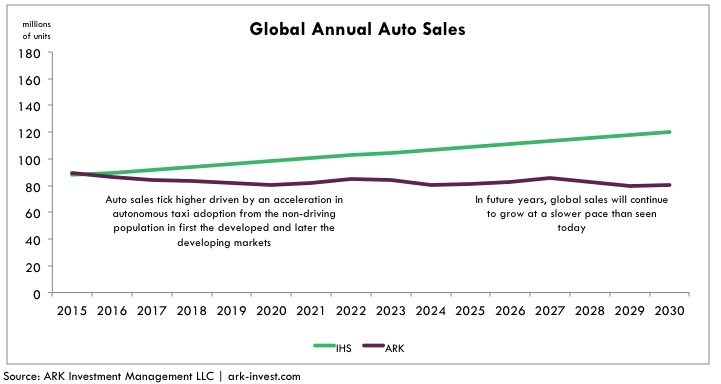 As shown below, IHS expects global auto sales to reach 98 million units by 2020, +20% higher than ARK’s estimate of 80 million units. 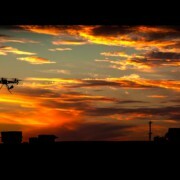 Ten years later in 2030, ARK believes that auto sales will be at roughly 80 million, a third lower than IHS forecasts. Note: IHS figures for 2023-2050 were extrapolated by ARK Investment Management LLC based on growth rates. ARK sees autonomous sales significantly outpacing current expectations, thanks to the per mile savings and convenience of autonomous taxis. 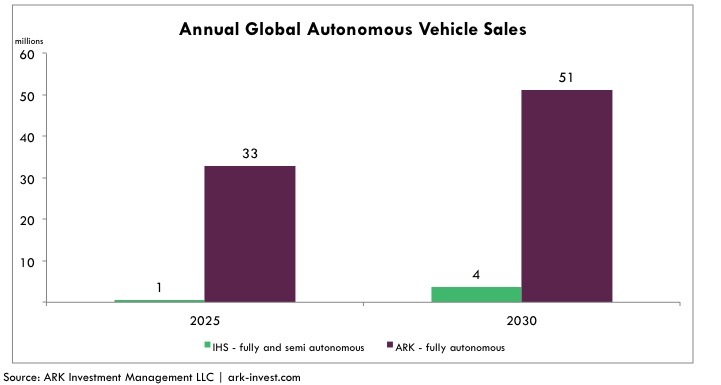 The stark contrast between IHS’s and ARK’s forecasts of autonomous vehicles can be seen in the graph below. 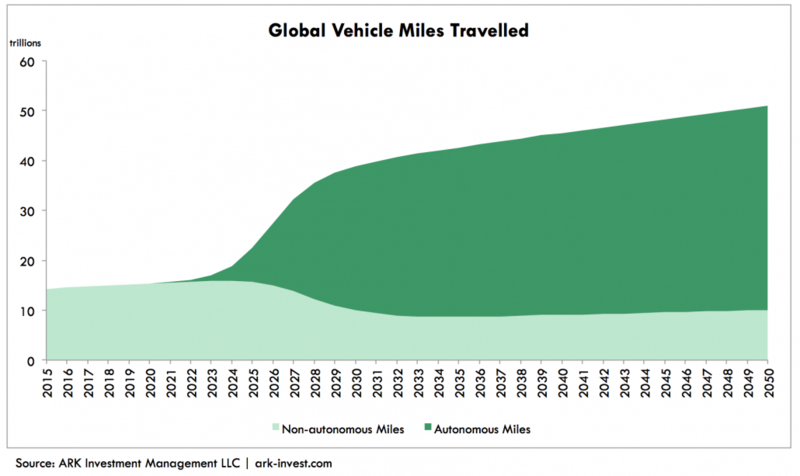 Although the number of cars on the road is likely to shrink, vehicle miles travelled could increase dramatically, as shown in the chart below, thanks to non-driving populations and the increased convenience of mobility-as-a-service. Consequently, while traffic will increase, autonomous vehicles will improve the efficiency of transportation with fewer human drivers. Even without shorter drive times, we think passengers may not mind waiting in traffic if they can watch NetflixNFLX or answer emails. 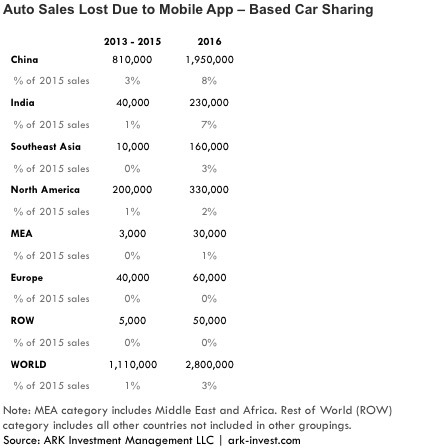 In sum, ARK expects global vehicle sales to be flat to down relative to today’s levels until 2030. 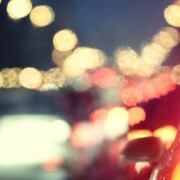 Automakers will likely have to adapt to new business models in order to survive. In all likelihood, the shared autonomous cars market will be dominated by geographic monopolies, causing automakers to consolidate. Already, merger and acquisition activity in the auto industry has increased to $74.4 billion3 this past year, or three times the annual average over the last ten years. Manufacturers like FordF and GMGM may already have seen the writing on the wall and are pivoting to an autonomous strategy. While ARK views players like TeslaTSLA and GoogleGOOG as leaders in the autonomous space, incumbent automakers will attempt to catch up. Given how much they stand to lose, traditional auto manufacturers could put up quite a strong fight. 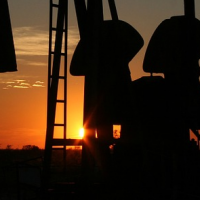 Autonomous Cars Could Add $7 Trillion to the US Economy Will Global Oil Demand Peak Before 2020?